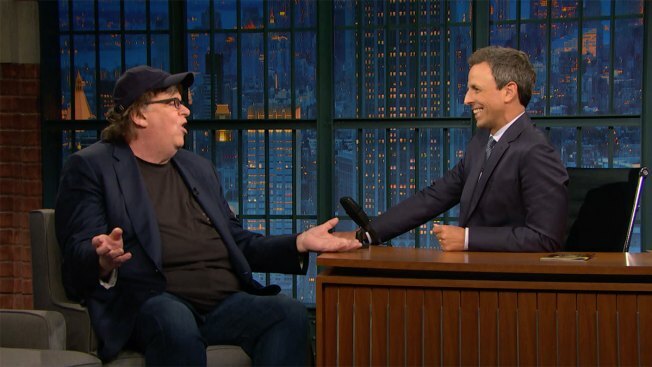 President Donald Trump has set his sights on a new target: filmmaker and Trump critic Michael Moore. "While not at all presidential I must point out that the Sloppy Michael Moore Show on Broadway was a TOTAL BOMB and was forced to close. Sad!" Trump tweeted on Saturday. The president criticized the liberal activist's one-man show, "The Terms of My Surrender," a limited Broadway performance that officially opened on Aug. 10 and was already scheduled to end on Oct. 22. Moore is an outspoken critic of Trump. In "The Terms of My Surrender," Moore shared stories, quizzed audience members and pleaded for activism. Whoopi Goldberg, Gloria Steinem, Billie Joe Armstrong, Lee Daniels and Rep. Maxine Waters, D-Calif., made appearances onstage with Moore. The filmmaker even led audience members to a Trump Tower after the Aug. 15 show to protest the president's reaction to deadly violence in Charlottesville, Virginia. Though "The Terms of My Surrender" was not a top show at the box office, Playbill.com reported, Moore's show did complete it's full scheduled run. Still, it mostly grossed less than half of its potential and drew in a capacity around the 70th percentile. Moore later took to Twitter to respond to the president's feedback. "You must have my smash hit of a Broadway show confused with your presidency-- which IS a total bomb and WILL indeed close early. NOT SAD," he wrote. Moore went on to chastise Trump for focusing on his broadway show instead of fallen service members in Afghanistan, the first charges filed in the Russia investigation and the ongoing crisis in Puerto Rico after Hurricane Maria. He claimed that "The Terms of My Surrender" was the highest grossing non-musical of the summer. While it was the highest grossing of those that opened in the summer, Playbill.com reported, "The Play That Goes Wrong" grossed more in the 12 weeks Moore's play was open. This is not the first time Trump has taken on a Broadway show. In Nov. 2016, then-President-Elect Trump criticized Lin-Manuel Miranda's "Hamilton" after castmembers took time onstage to address then-Vice-President-Elect Mike Pence, who was sitting in the audience of the Pulitzer Prize-winning musical. Trump said Pence was "harassed" and that the cast was "very rude"